It is the time of year that peppermint seems to be everywhere, and I love it! From the candy canes at the grocery store to the holiday coffee flavors at my local coffee shop, it is officially peppermint season. There is something so festive about peppermint, don’t you think? 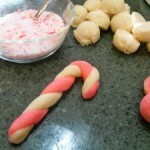 My kids love these cute candy cane cookies sprinkled with crushed peppermint candy and sparkling sugar. When they see these in the cookie jar they know my holiday baking has begun in earnest. 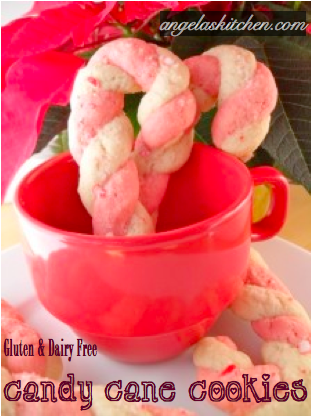 Gluten and Dairy Free Candy Cane Cookies freeze really well so I usually bake these early in the season. They dress up any cookie tray and look really cute in cellophane gift bags for giving as gifts. Try one with hot cocoa when the snow flies. If you have any of the peppermint candy/sugar mixture left over from making the cookies, stir a bit into your coffee or hot chocolate. Yum! Minty goodness! Put the peppermint candy into a heavy-duty plastic bag. I usually use two freezer bags because the candy can tear through the bag during this step. 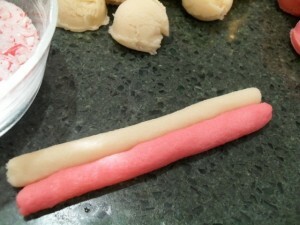 Crush the candy using a rolling pin on a hard surface. Mix the crushed candy with the first measurement of sugar. Set aside. In a bowl whisk together rice flour, potato starch, tapioca starch, xanthan gum, baking soda and salt. In the bowl of you mixer, beat the margarine with second measurement of sugar. When light and fluffy, beat in the egg, milk substitute and vanilla. Mix dry ingredients into wet ingredients until well blended. 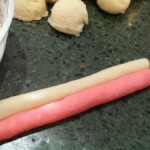 Divide dough in half, setting half aside. 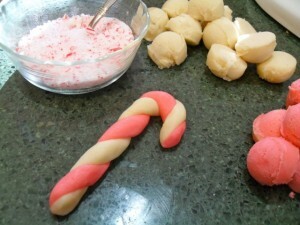 Add red coloring to remaining half of dough, mixing well until color is all incorporated. Wrap each portion of dough well and chill for at least 2 hours or overnight. When ready to bake, preheat oven to 350 degrees F. Take dough from refrigerator. 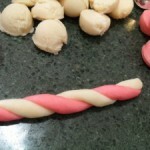 Working with walnut sized pieces of dough, roll one white piece and one red piece into a rope shape about 5 inches long. 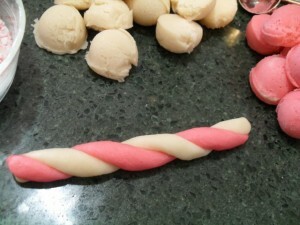 Twist one red and one white rope shape together, then curve the end to make the cookie look like a candy cane. Set on baking sheet. Continue with remaining dough. Sprinkle shaped cookies with crushed candy and sugar mixture. Bake at 350 degrees for 12 minutes. After baking allow cookies to set up for 5 minutes on baking pan before removing to cooling rack. Freezing Directions: Allow cookies to cool completely. Put cookies into a freezer container, separating the layers with waxed paper. Seal, label and freeze. 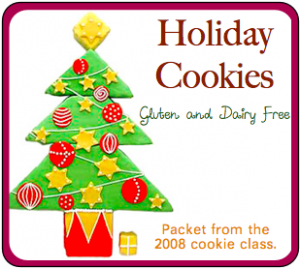 Need other holiday cookie ideas?